"Are we nuts?" asks Jim as he emerges from the back cabin to slowly uncurl himself from the forward crouch needed to maneuver in the awkward space. "Probably." I answer intently mixing the ingredients for the Caesar salad dressing. "We should have sprung for buckets of Downey's chicken instead of filets." Head tilted he aimed his gaze first at the saloon then directly at me. "Never mind that we're loading the boat to leave Monday. Dinner for eight, what were we thinking?" "They're our friends." I shoot back as I survey the chaos surrounding us before popping the dressing down into the refrigerator. "I wanted the last dinner to be aboard the Damn Yankee." "I know." Jim says in a long-suffering tone. "And it's our turn," I insist. My logic escapes him. I notice his surreptitious glance at the pile of green trash bags stuffed to overflowing that have taken up permanent residence in the Damn Yankee's saloon. The remainder of our worldly goods, the sum total of over thirty years of working sits in a pitiful heap. And I've got less than two hours to get the stuff stowed before the B-dock crew descends salivating and thirsty. I managed. Wine flowed releasing a torrent of memories. Tonight, even Mary Sue succumbed to the lure of the grape. Louis as always was up to the task of grilling the steaks. He never disappoints illustrated by the phenomenon of "complete consumption." Nary a scrap remained for Mary Sue's dogs. And for once, I remembered all the ingredients for the Caesar salad. There were all the makings for a fine evening with dear friends to end this year's boating season. Except that Jim and I were leaving permanently. Even dreams have consequences. Shadows flickered across all eight faces back lit by the muted light. Faces representing more than a decade of friendship, a significant time used to forge and strengthen our bonds. Friendships we all participated in molding. I swallowed my wine quickly hoping it would loosen the tightness in my throat. Jim and I recognized its value. We prized its continual promise. Still, we would willingly change its shape. How would we live with the arrogance? So we proceeded to toast and roast. Each recollection triggered another thought until they all tumbled loose. Tapping glass to glass we woman giggled like adolescence over boom diving and skinny-dipping after dark. Louis's eyes gleam at reminiscences of AM oyster shooters at The Middleton then in the PM, the raw bar at McGarvey's. Anchoring out together, we luxuriated in the romance of wine and sunsets, of candles and cockpits. "Whose turn to do dinner." I prompt the critical question always answered before departure on Sundays. Sue responds with, "Cindy," and points while she shakes her head back and forth laughing. "Remember those mid-night sails after the girls kept us up dancing all night to Dave Brand," Jim asks? "Thank God, we're too old for that now." Art stretches and puffs on his cigar before topping off his wine. "Remember martini probation?" Cindy hoots as she empties her glass and reaches for the Chardonnay. "Thank God that's over." Sue declares with an challenging flash of eye directed at her husband. "Lucky the Insatiable didn't burn to the waterline," Joe interjects. "We were going to cut you loose," Jim continues. "Then what would we have done for dinner," Louie retorts, neatly summing up everyone's priorities. "After meeting Louie," Jim says, "it's a wonder we all can afford dinner." "Truer words were never uttered." Art raises his glass. "To Lou, whose relentless coercion got all the woman new boats." "And improved the wine drunk on the dock…" Jim says. "And has Art smoking cigars…ugh…thanks Lou." Mary Sue shouts. "And he's grinning like a fool because he's got us all in debt. Gwen and I have to leave to save any money," Jim concludes. We all happily lift our glasses to Louie. They drifted off shortly to their own boats, two by two. I decided not to count the wine bottles. Our last supper had been a rousing success. I dropped off to sleep awash in memories. But there was still tomorrow. I think of our last week home as one long good-bye. The kids offered a cheerful rest at their home. Poised to ignore the circumstance of our actual leaving they both maintained an easy equanimity. I didn't possess such control. My stomach stayed clenched the entire time. So, I busied myself setting out pottery bowls and glass pitchers from Jim's and my home then re-arranged their family room so I could maintain a visual of them preparing meals using the pottery and sitting together in a room more conducive to conversation. I felt much better. They indulged me. Always creative, Erin and Jimmy even devised a clogged sink to occupy themselves with that last week, just to distract me from that final good-bye. "Mom, we could use a vacation anywhere tropical. We'll be there. And if Dad's treating…?" "If Dad's treating, I know you'll be there." It's Sunday. The littlest of the B-dock crew just wants her lunch. Elizabeth is hungry and vocal. Lunch preparation today on the Insatiable is slow and deliberate. Joe and Sue, Jim and I are savoring our time together. One last Sunday afternoon, one last pitcher of Bloody Mary's to polish off. The day is spinning too fast. My stomach is clenched tight again. I want to freeze the action. I want to watch Elizabeth eat lunch next week, next month. I want us all to have Thanksgiving together. I want to plan B-dock's winter get-together. I'm scared. I feel weighted with the enormity of what we've done. "Jim, Gwen its time we're on the road." Cindy leans into the companionway of the Insatiable with a shrug. "Coming…" I answer getting up. The others follow. It's time. "Don't go all mushy on me, now." Louie's voice rasps into my ear. He pulls me tighter. I can barely breath but I crave the closeness. This is way too hard. I wrap my arms around him till my arms ache. I can imprint myself with the feel of him, tangible reassurance that I'll always remember. I'm soaking his tee shirt. "Don't go all mushy now." He repeats before his arms loosen to release me toward Cindy. Over her shoulder I watch Jim envelop Louie in a bear hug that lasts long minutes. We finish stepping through a stilted dance of good-byes. Then Jim and I are alone. Together we empty the last items out of our dock box that has now become Art's. One more piece of ours that belongs to someone else; I wish him the enjoyment of it. Minutes later, I'm cramming an ice bucket we don't need into a too small space in the back cabin. It's an awkward fit. I curse loud enough for Jim to hear. "We don't need that, Gwen. Let's leave it for Art." I lifted my head while continuing to shove that damn ice bucket that Jimmy had given Jim for his fiftieth birthday against an unyielding mass of tools and spare pumps. Jim's mouth closed abruptly. He pulled out two pumps, A box of tools and a soft bag of light clothing. Then he rearranged the Pawley Island hammock and set that ice bucket where we'll probably never see it again. But I was happy. "You may want to set another anchor." The loud rattling stir of the outboard motor died just as a dinghy bumped against the starboard side of the Damn Yankee. "I think you're right," Jim replied. Leaving the lunch I was preparing, I hauled myself up the companionway to the cockpit. What were they talking about, another anchor? We were in Back Creek. "I always follow whatever everyone else is doing. Seems they've all set second anchors. It's pretty tight in here." My gaze followed the stranger's out swept arm as I surveyed the crowded anchorage. "I'm Ron," he said. "We've been here two weeks. My wife, Jeannie's volunteered at the marina. We're waiting out hurricane season, just taking our time." "Thanks. Let me get my line attached and pull out my Danforth." "Be glad to take it out in my dinghy," Ron offers shielding his eyes from the glare of a streaming golden sun. "Be back in a few…" Ron fires up his outboard and pushes away weaving through the brood of hulls resting on the water in the Back Creek of Annapolis. "One day out and we meet Captain Ron. No one would believe it." I shoot a grin at Jim. He laughs and proceeds to haul out the Danforth. "You'll love the life," Captain Ron enthused over a glass Cabernet and home made salsa that evening. "Won't they love it, Jeannie?" She smiled a bright smile, nodded her head. "Yes, you will. We've been cruising for ten years now." "Ten years," I repeat glancing over at the Vixen, Ron and Jeannie's 52 ft Tayana. Blue hull, sleek classic lines Vixen rides the water with unassailable pride of place, her masts raking the sky. Like her owners, Ron and Jeannie Tew, she speaks a language different than Jim and I and the Damn Yankee. We gratefully soak up the lessons they willingly offer. They left us with more than a few extra charts and a well used copy of "Passages South" by Bruce Van Sant. They intrigued us with the explicits of Bahamian style anchoring, explained well-traveled routes to Paradise promising pot luck suppers in secluded coves and daily volleyball games in Georgetown. In return, we offer them Davis's Pub in Eastport. 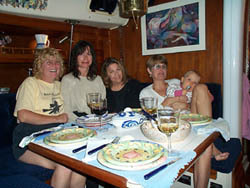 A second evening in the company of cruisers, they speak a language all their own; Bimini, Bitter End, Dominica, Exumas, and Venezuela. They'd all been there, done that. Jim and I clutched our beers, listening reverently, feeling totally alien in a place that, up to then had been comfortably familiar. We wouldn't have missed it for the world! The lure of the boat show beckoned. We were ready and willing to spend our money. Caught in the flowing current of people, I drifted behind Jim as he sailed purposefully from tent to tent. But by day's end, we'd purchased a set of Gill foul weather gear and a clock and barometer by Weems and Plath. That touch of brass is a must for the well appointed saloon. Then Jim got serious purchasing a selection of electronic charts for the radar. I never would have thought of a lifting harness for the outboard motor or the importance of another length of chain. I suspect that the boat shows' selfless intent is to remind us of the array of items necessary for our safety and comfort, displayed under the brightly colored flags of free enterprise. I managed to pass the Tilley hat booth without purchasing. Jim's suggestion of a drink distracted me. Then I forgot. But, I didn't forget the boat shoes for him or the replacement sailboat charm for me. So, caught up in the frenzy of buying, we bought the ultimate in pressure cookers for more money than All Clad would dream of charging. We were weak from hunger and the chicken was really good! Only one last item left to purchase, a good thing because after our spending spree, Jim was beginning to pale underneath his tan. The life raft, an understandably large expense that one hopes never to put to the test. 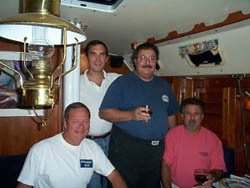 We purchased a Winslow after watching their video and accessing the ratings in Ocean Navigator and Sail magazines. No doubt, the Winslow will do its job. Our purchases completed and our funds depleted; we joined Art and Mary Sue on Friday evening around the piano bar at Phillips. A few sets by Larry Scott and Molly distance us from the piercing twinge of an additional good-bye. It's a mellow evening. Jim and I are already thinking ahead. The trip down the Chesapeake, Norfolk, entering "the ditch." So, with the farewells behind us and the adventure ahead of us. Jim and I will slip the lines. The Damn Yankee will surge forward, her bow rising over the waves in a burst of exuberance as Jim and I step into the wind.